The alien-like parasite inside the mouth of that fish is called "cerathotoa italica," that parasite eats the fish tongues to replace it and lives inside. Almost half of the fish in some areas on Mediterranean are infected with the parasite. Ceratothoa italica is a parasitic crustacean of the family Cymothoidae. It tends to be 3 to 4 cm long. 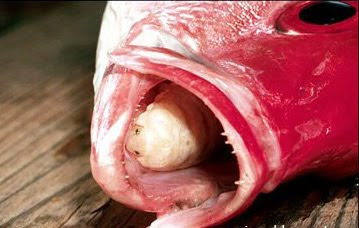 This parasite attaches itself at the base of the spotted rose snapper's (Lutjanus guttatus) tongue, entering the fish's mouth through its gills. It then proceeds to extract blood through the claws on its front three pairs of legs. As the parasite grows, less and less blood reaches the tongue, and eventually the organ atrophies from lack of blood. According to dailymail.co.uk , "ceratothoa italica breeds by entering the mouth through the gills. A female parasite will then take up position on the tongue, virtually replacing it, and feeding on blood as it grows to adulthood. "The researchers also found that the parasite had worse effects on fish from heavily fished areas - while the parasite infection significantly stunted growth and condition in the Italian fish," said on MailOnline site. However, not all of us eats the fish head, right? So why bother? study show that the parasite does not cause any side effects to the human, it only stunts the growth of the fish, and lowers their life expectancy. Comments or suggestions about "Alien parasite inside the mouth of Fish" is important to us, you may share it by using the comment box below. No idea not until now fish can have parasites affecting a part of their bodies only. nice information.